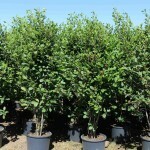 An upright, narrow shrub with lustrous dark green oval shaped foliage. 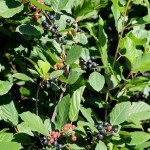 It has red to purple-black fruit in the fall, with yellow fall foliage. It makes a useful hedge or accent plant. Prefers sun to partial sun, good drainage, and is drought tolerant once established.